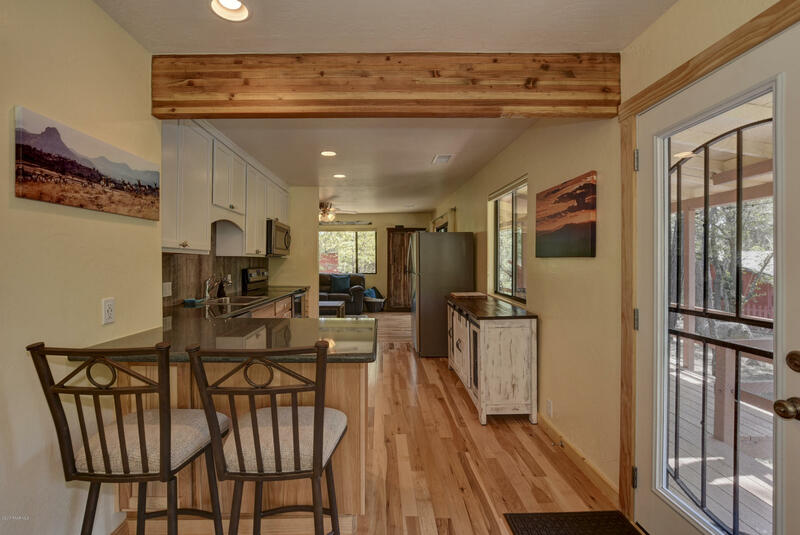 We have spent the last year painstakingly remodeling and decorating this beautiful little cabin in Ponderosa Park. 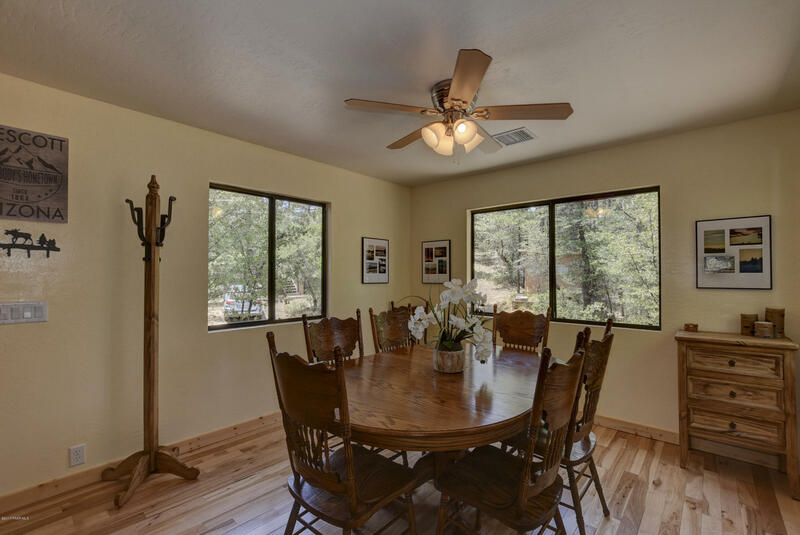 Established in 1866 Ponderosa Park is an in-holding neighborhood of approximately 250 homes south of Prescott, AZ. 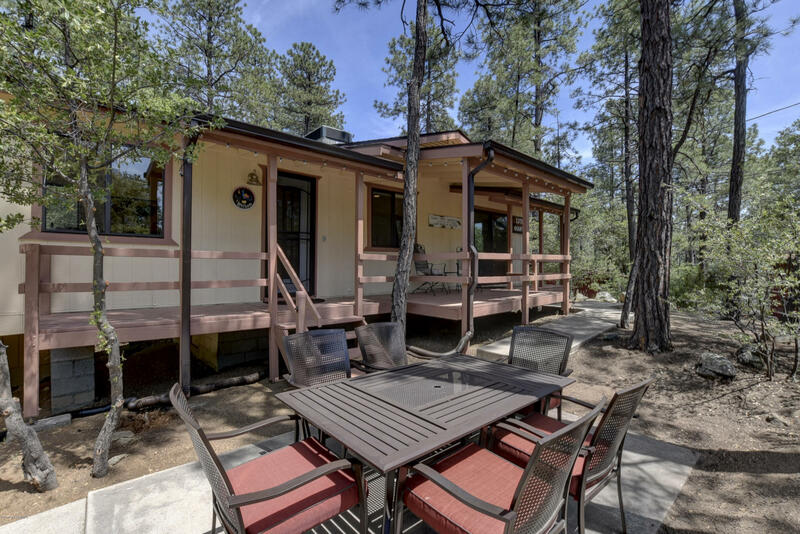 The cabin is nestled 5.5 miles from the Yavapai County Courthouse square and famous Whiskey Row. 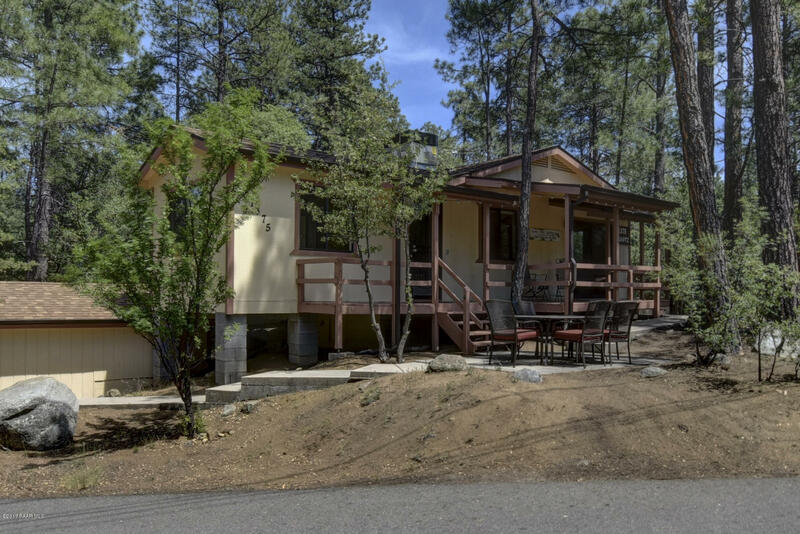 The community of Ponderosa Park is surrounded by the Prescott National Forest. 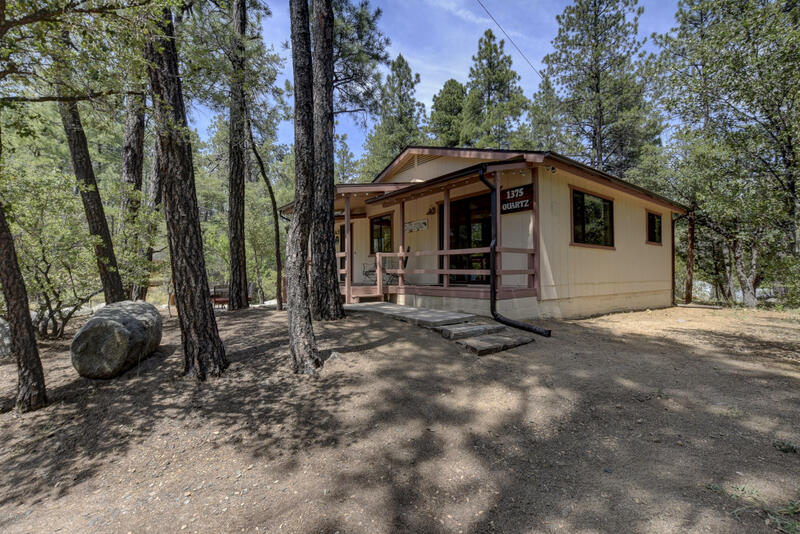 The Prescott National Forest provides endless outdoor recreational opportunities. 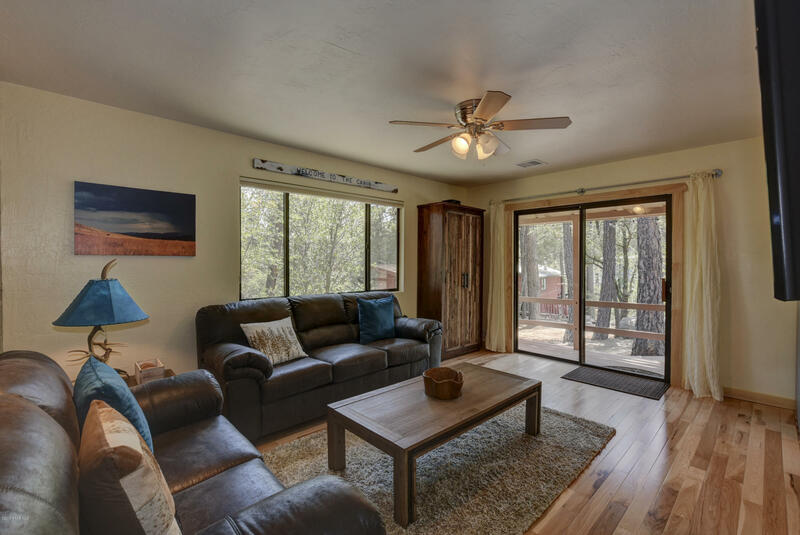 We often see wildlife including mule deer and javelina from the front porch.Enter the cabin via the covered front porch into a warm and open living area. 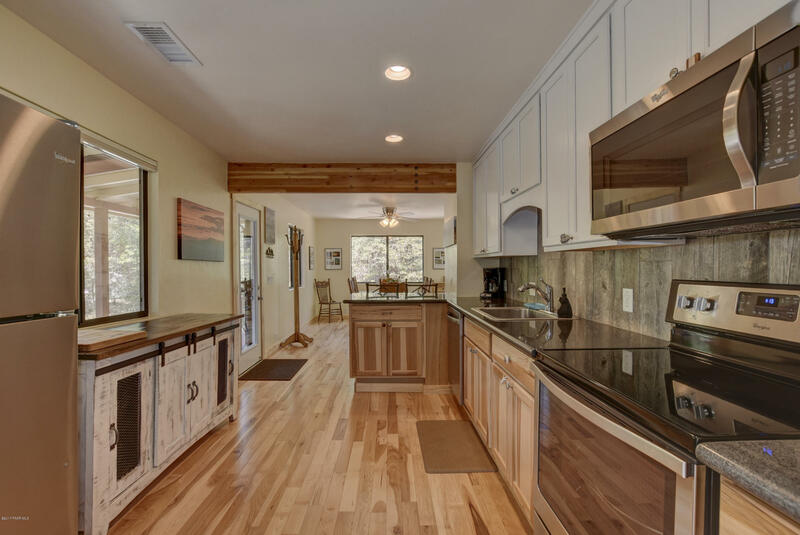 The floor plan features lots of light, hickory hardwood floors, pine trim, beautiful art, views of the pines and surrounding forest. 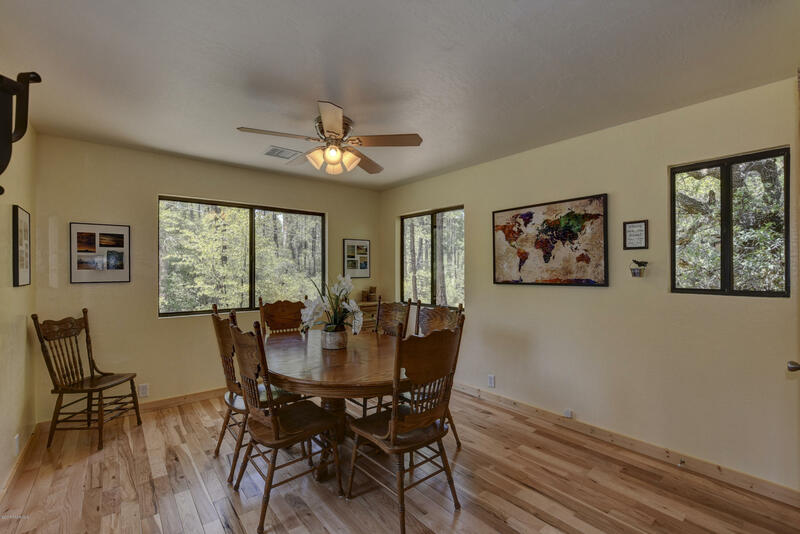 Off one end of the kitchen is the dining room, be sure to “pin” your home on our world map. 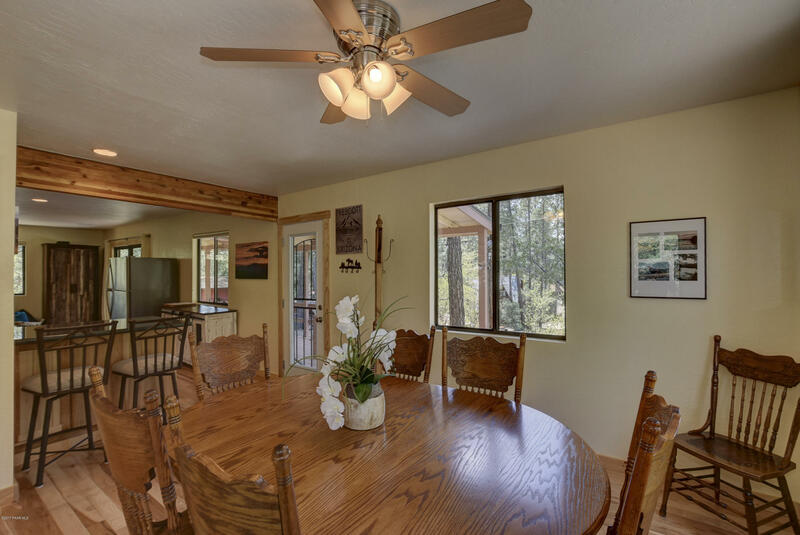 It features a table with seating for seven. 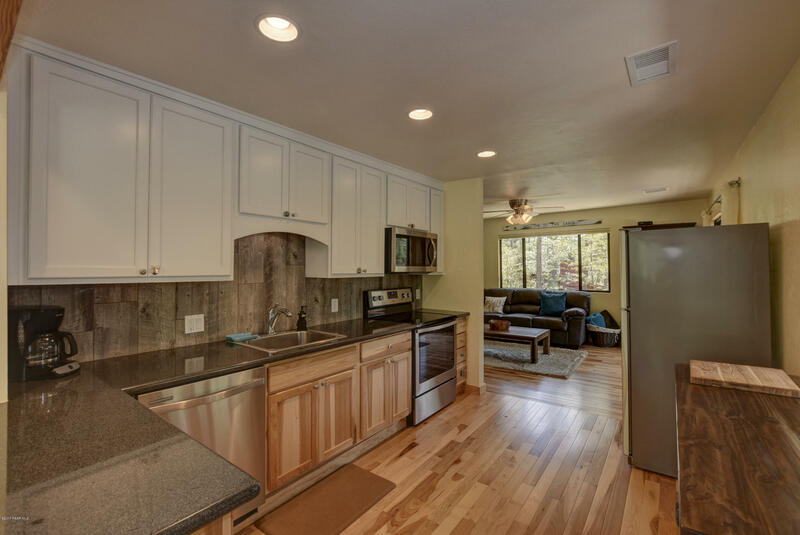 The fully stocked kitchen features stainless steel appliances, granite counters and a breakfast bar with two stools. 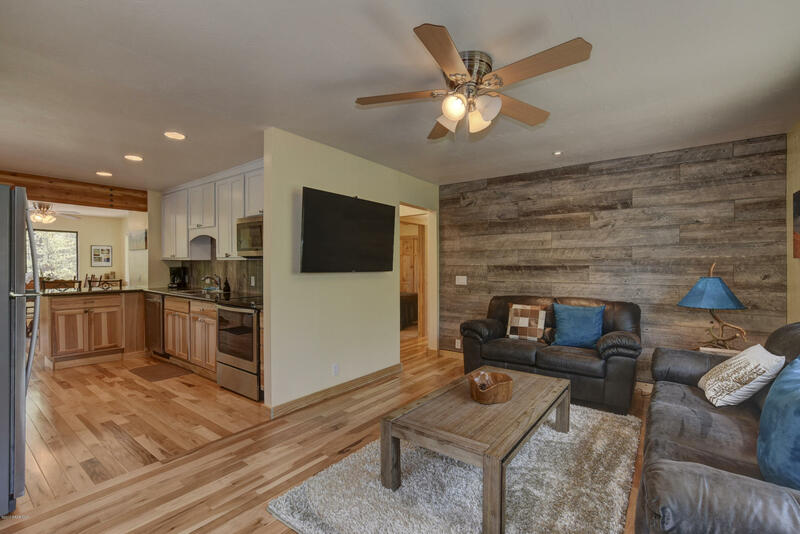 The living room has a couch that is a pull out sleeper with pillow top memory foam mattress; the other couch is a love seat. There is a 54 inch smart television which is connected to basic cable and wifi. You can play music or stream television. 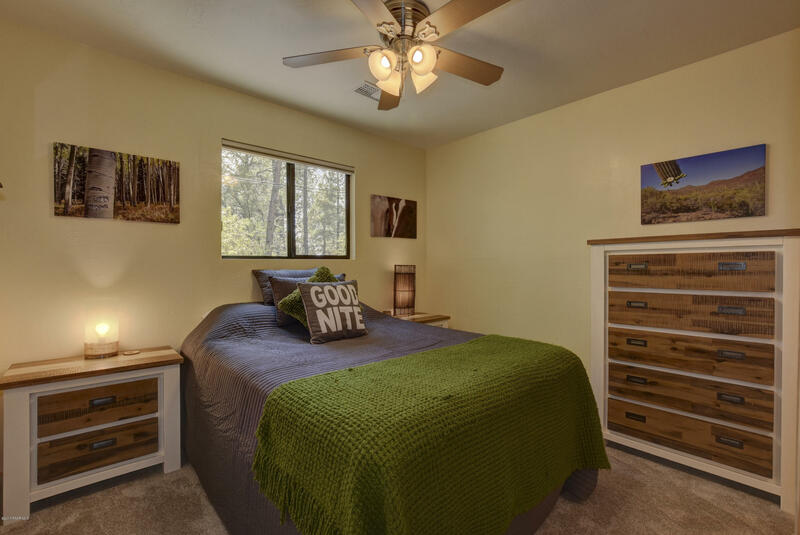 The master bedroom features a king memory foam mattress and 32 inch smart television. 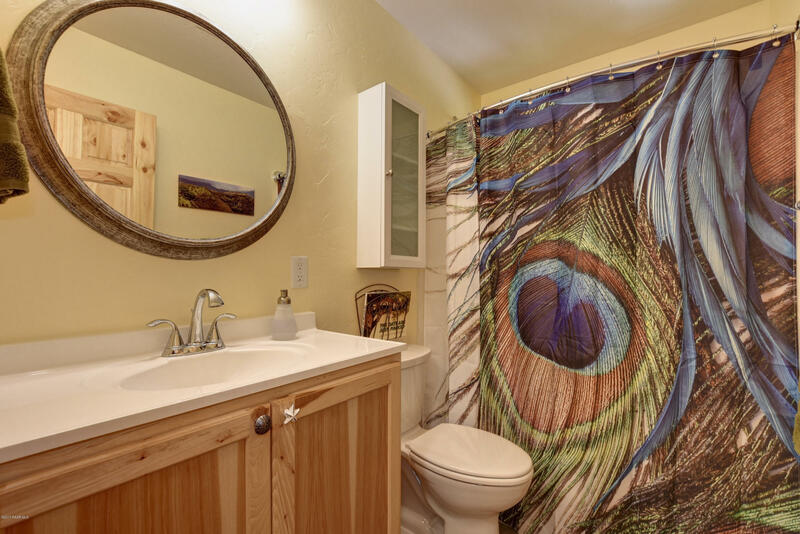 There is an on-suite Â¾ bath with tile surround, linen storage and closet. 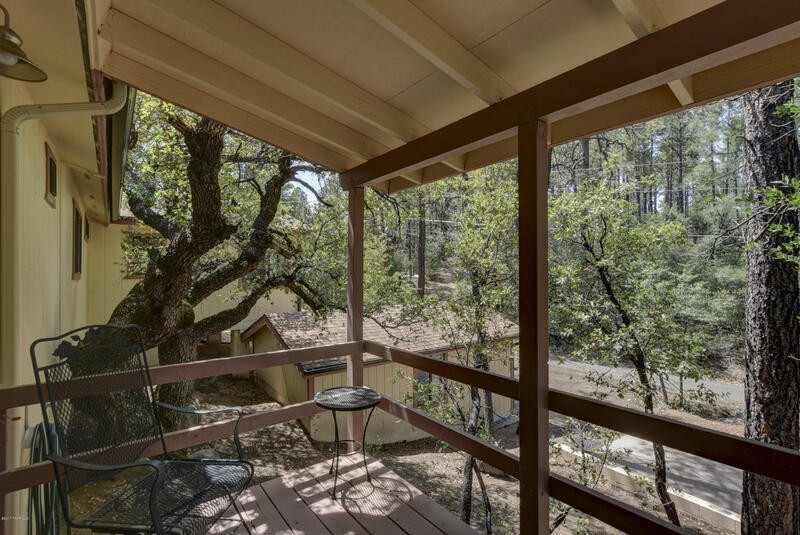 There is also a private covered patio with seating for two. 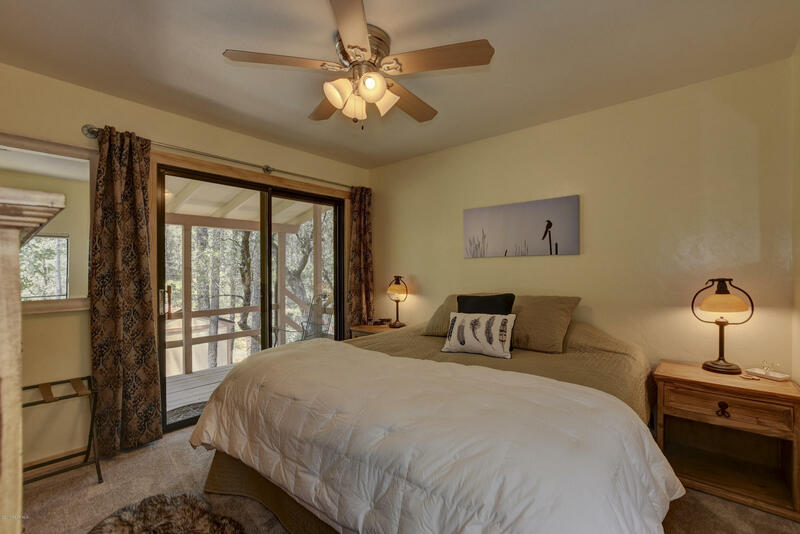 There are two guest bedrooms, one has a memory foam queen bed and the other has a twin bamboo mattress. 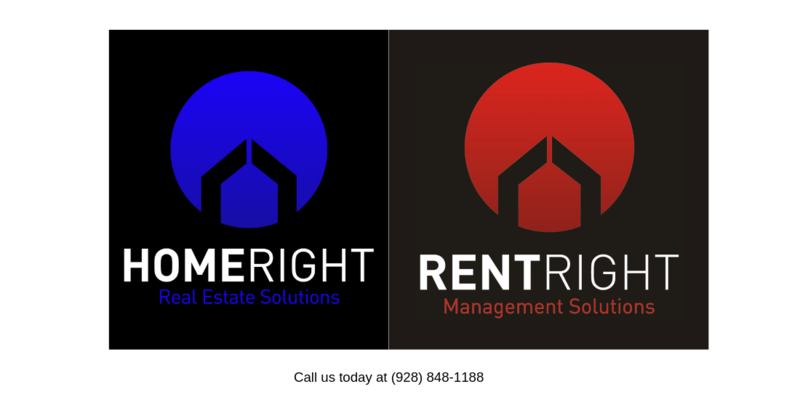 Both have closets. 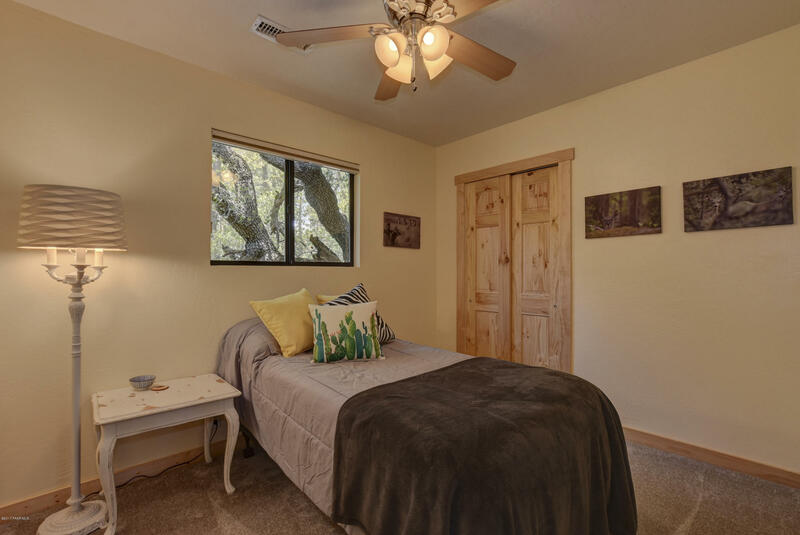 All three bedrooms are carpeted, have ceiling fans, black out shades and are equipped with extra blankets and various pillows to ensure a cozy stay. 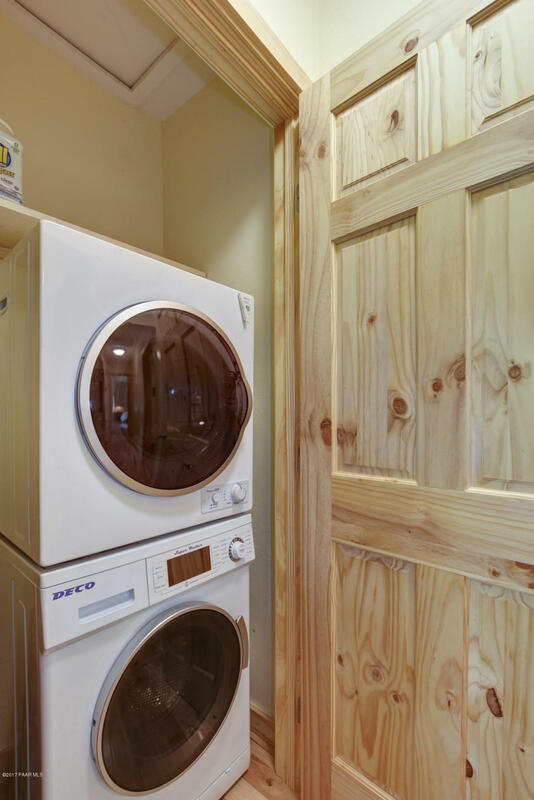 In the hall is a closet with washer and dryer. 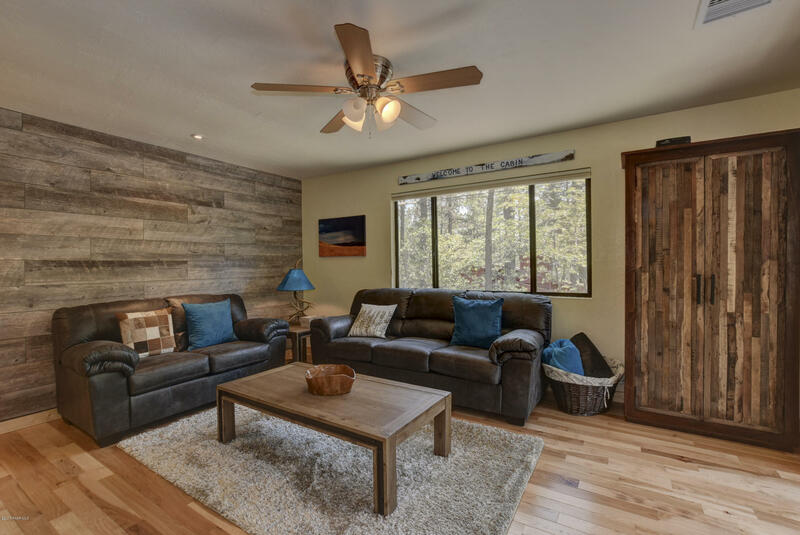 Cabin has books, cards, games and horseshoe pits for your added enjoyment. 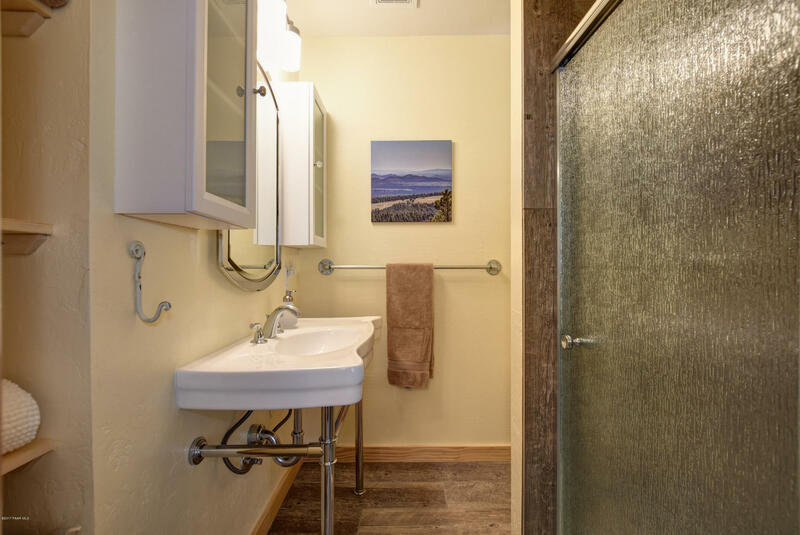 Expect clean linens, hand soap, dishwasher soap, laundry soap, toilet paper and paper towels upon your arrival. 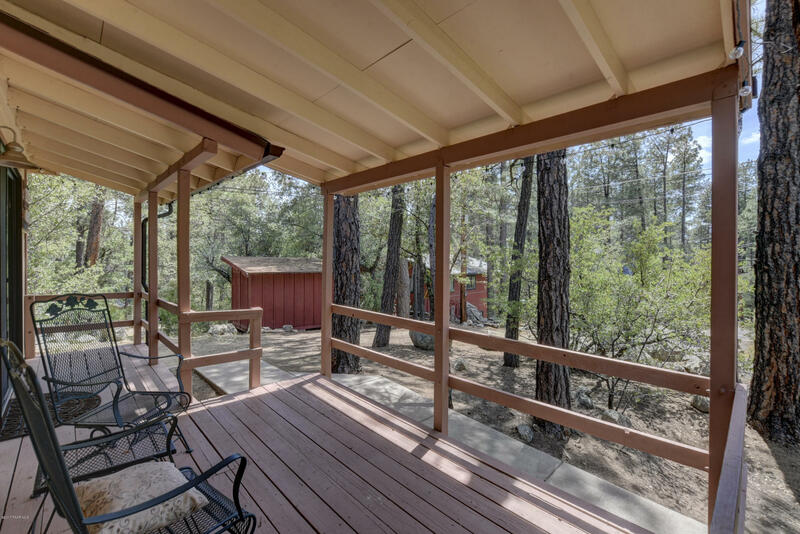 The exterior features a covered front patio perfect to enjoy morning coffee or an evening adult beverage. There is a large outdoor table with seating for six. 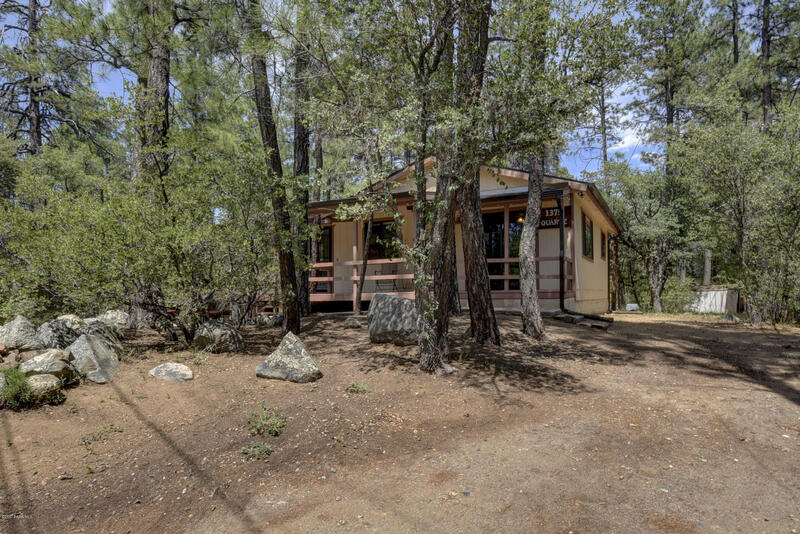 Around the side is a detached one car garage with a propane BBQ grill, extra refrigerator, 2 folding tables and extra outdoor chairs. 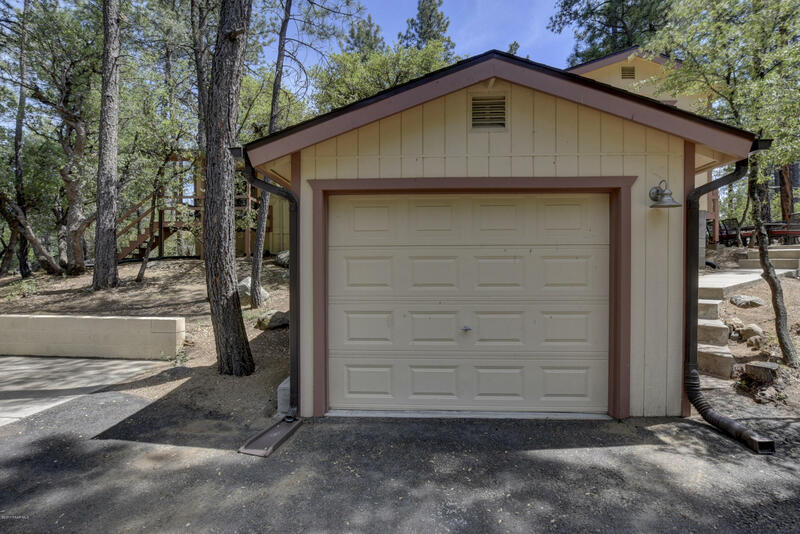 The one car detached garage (18×10) provides a convenient place to lock up mountain bikes, quads or outdoor gear when exploring downtown Prescott. 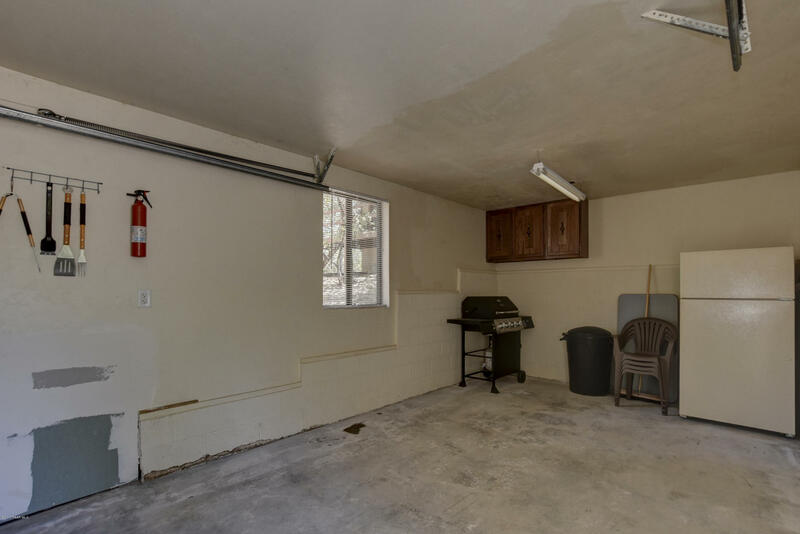 The garage door measures 8’10” x 6’11”. 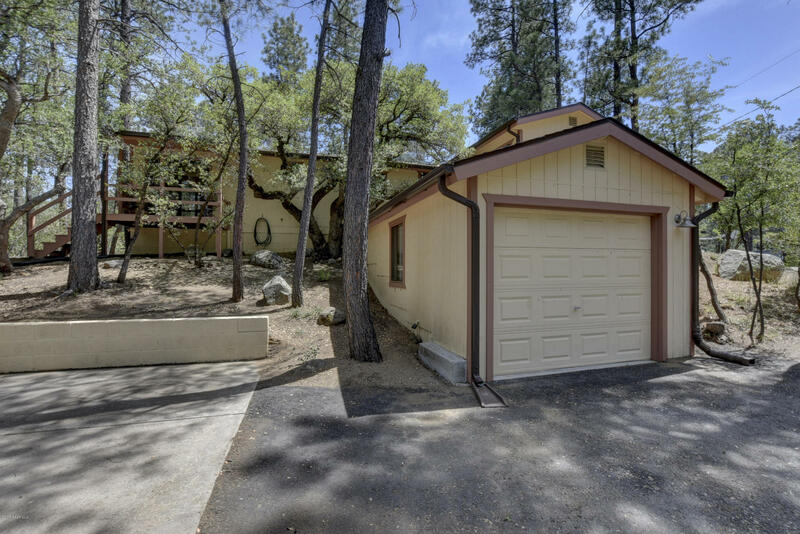 The front driveway allows parking for 3 vehicles with room for an additional car by the garage. 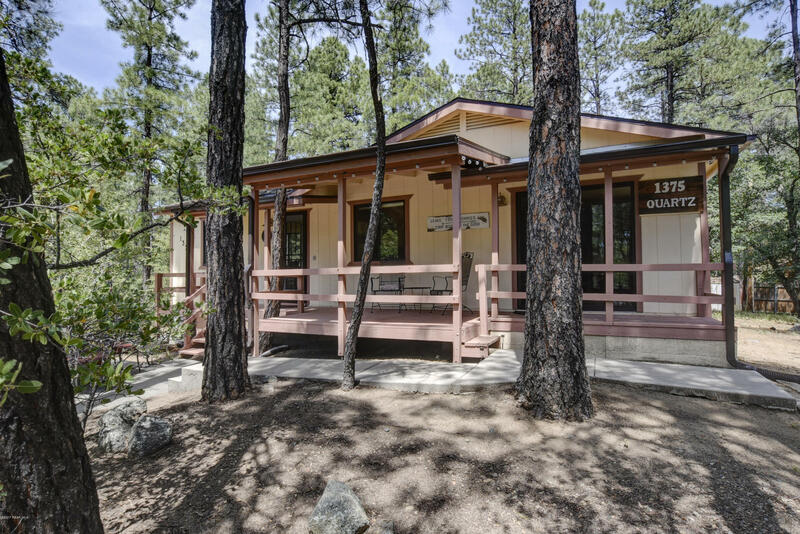 Ponderosa Park is a great jumping off point to miles of Forest Service Roads and Mountain Bike Trails. 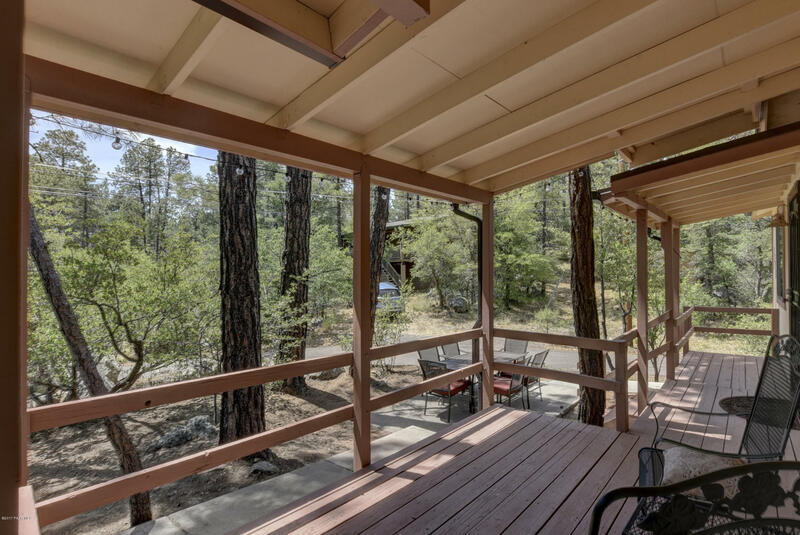 We hope you enjoy the feeling and serenity of this special place as much as we do.